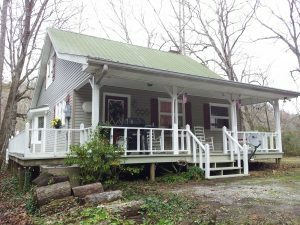 A sweet 2 bedroom 2 bath cabin with a sleeping loft located on the Chestatee River. It is located 5 miles East of Dahlonega. Well and comfortably equipped with all the comforts of home. Master Bedroom on main floor with king size bed, whirlpool tub and powder room. Upstairs bedroom with queen bed located across the hall from full bath. Sleeping loft upstairs with 2 twin beds. At your door – fishing, tubing, rafting, and panning for gold. Nearby – gold mine tours, hiking, shopping, zoo, wine tasting and vineyard tours, Amicalola Falls, and touring the North Ga mountains.